An intensive 4-week online program that will equip you with the mindset, techniques, and tools to kick-start your journey with eye tracking. Systems: Screen based (remote) eye trackers and Tobii Pro Studio; or Pro Glasses 2 eye tracker and Pro Lab. Pre-requisites: access to a screen based eye tracker, Tobii Pro Studio software and license key; or to a Pro Glasses 2 eye tracker, Pro Lab software and license key. The Tobii Pro Onboarding program helps new users of Tobii Pro eye tracking get started on the right foot. This program gives you access to a wealth of learning resources on our hardware, software, study design, data collection, analysis, and much more. If you have purchased an onsite training we recommend you to take this course after the training, as a tool to further cement the knowledge acquired during the training. Getting started in eye tracking can be as daunting as it is thrilling. 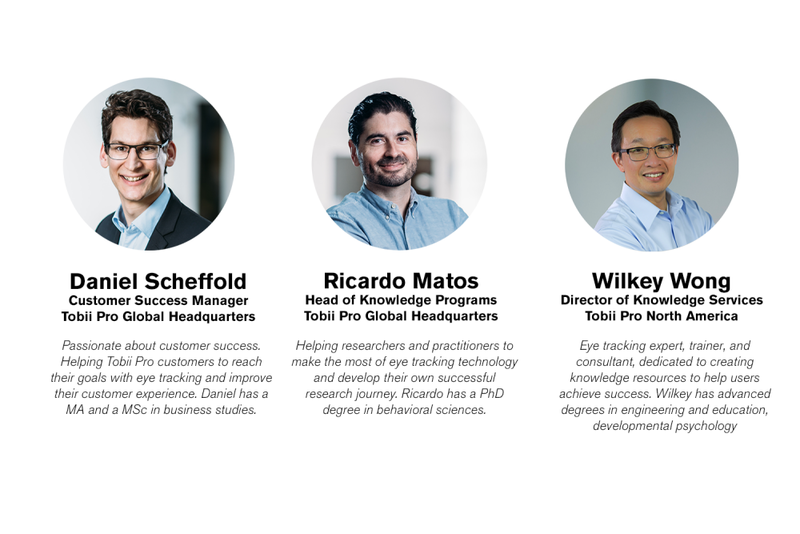 Our program was designed to provide Tobii Pro customers with the knowledge and support to build up your confidence and eye tracking competence as quickly as possible. This course will accelerate your eye tracking adoption enabling you to reach your research goals faster. I really enjoyed the program and felt it was very well pitched for me as a relatively novice researcher in the area. (...)The program helped me to see what I also didn't know which will be vital as I move forward in my PhD. Four weeks of intensive learning-by-doing with relevant materials and tasks. The course demands high commitment and engagement while being designed to be flexible. You will receive weekly emails to enable you to keep to schedule, however most will happen on your own time. Expect to dedicate 3-5 hours per week for webinars, readings and solo work. There are also additional tasks and suplementary materials that you can work on if you have some extra time to spare and wish to learn more. Put ideas and tools into practice with weekly tasks to build your competence with the eye tracker and software and accelerate your learning process. If you have both systems choose the one you wish to learn first. Once you have clicked on enroll, you will shortly after receive a confirmation email with some important information about the program. One week before the start you will also receive a welcome email with further details and materials for the course. If you have purchased an onsite training, we recommend you to set the start date after you have received the training. Want to know more? We are happy to help, just email us.